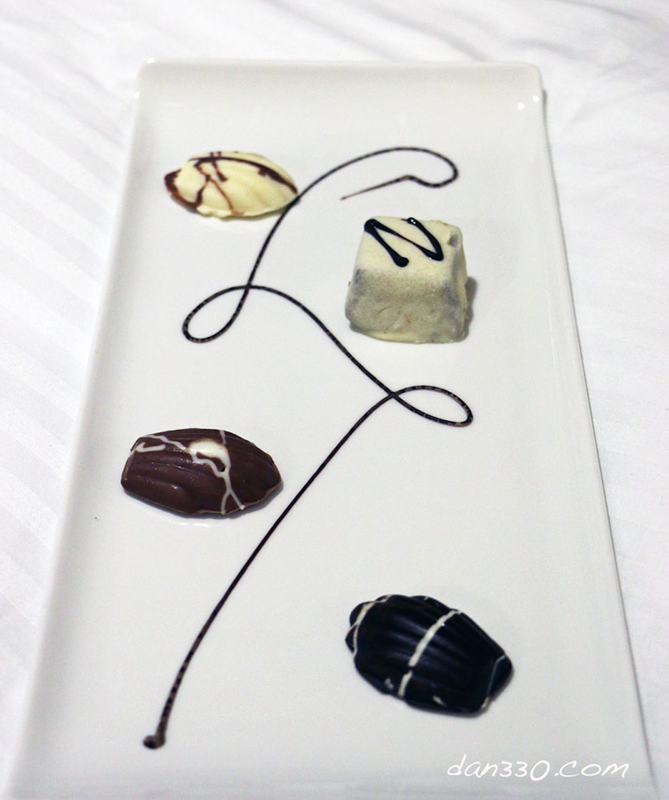 This is the fourth post in the series Cruising on the Norwegian Dawn. 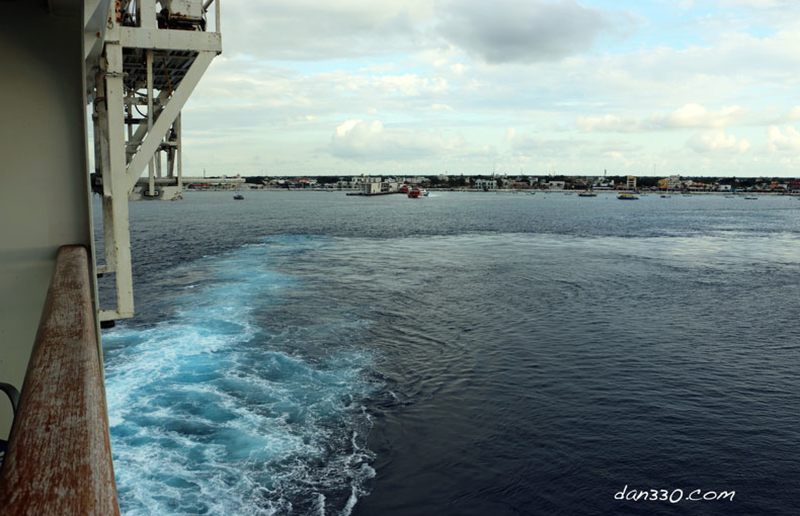 After a day at sea everyone was ready to get to Cozumel. Lots of the things to see and do. Norwegian has several shore excursions scheduled. 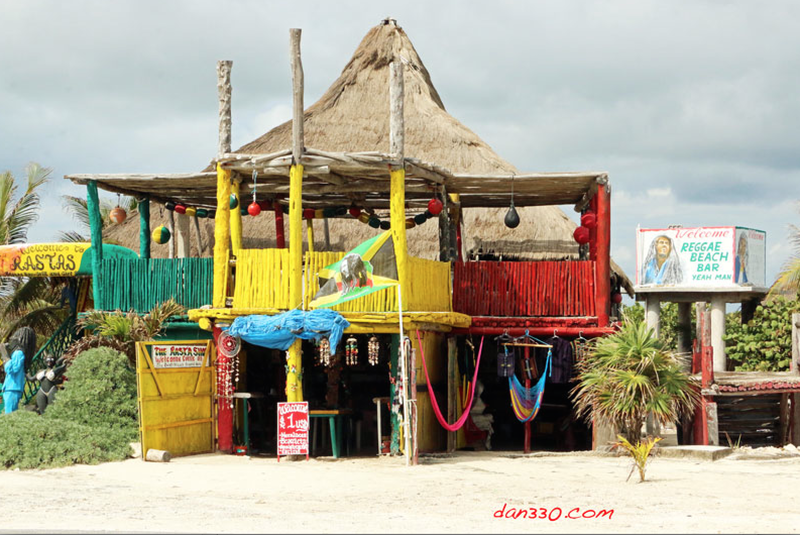 Whether you are a beach person, a history buff or just want to taste local cuisine or tequila, there is a tour for everyone. 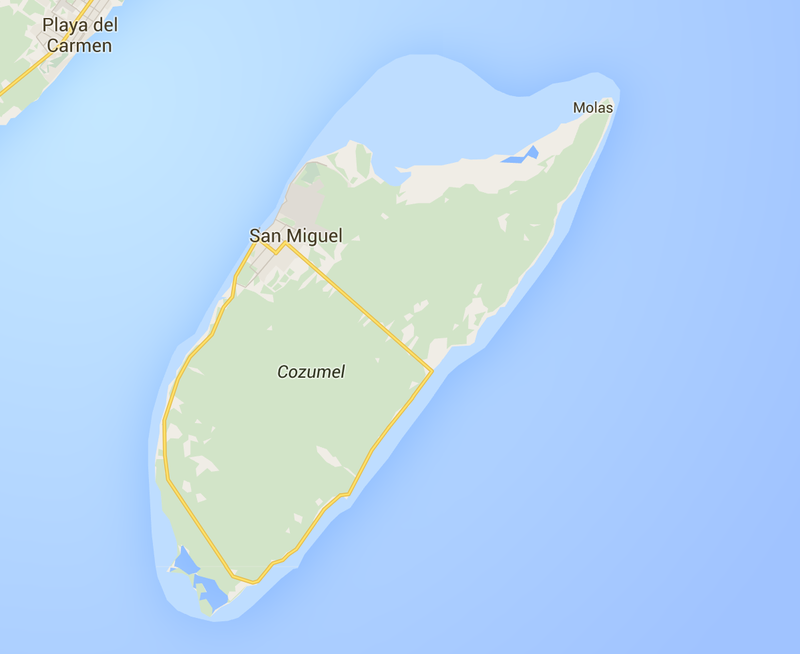 Cozumel is an island located in the Caribbean Sea along the eastern side of the Yucatan Peninsula about 50 miles southeast of Cancun. 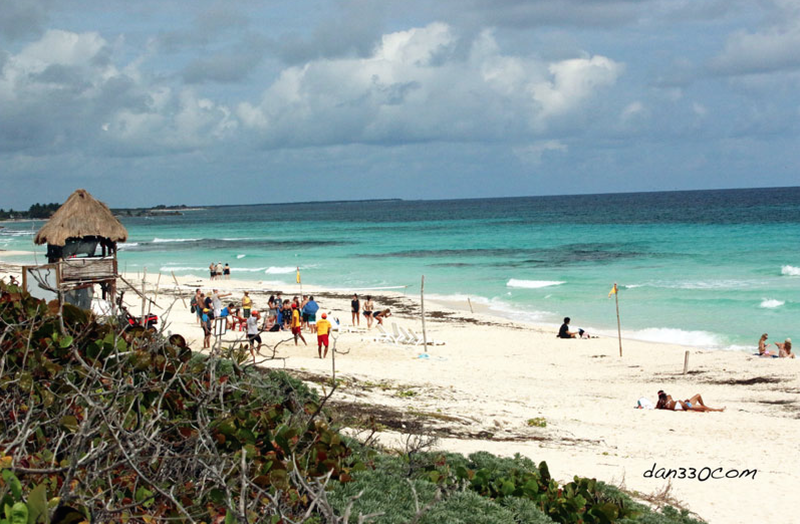 Snorkeling, Scuba Diving and Fishing are very popular in Cozumel. Of course being a popular port of call for cruises, there is plenty of shopping too. We arrived early morning at the pier in Cozumel. I was up working on the computer with the door to our balcony open as we arrived. It was fun to see the smaller boat buzzing around getting ready for the tours they would be taking people on. The fresh air was awesome too. I don’t think I can cruise without a balcony again. Our plan for the day was a leisurely breakfast at Cagney’s Steakhouse on the ship and then I would head out by myself. Laurie was taking a down day. We have both been to Cozumel a few times before so this worked just fine. I spent years on the road traveling and am used to exploring places by myself. With the camera equipment tucked safely away in a backpack I headed to the lower part of the ship where you exit to the pier. 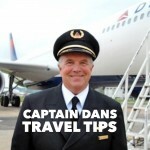 Security is tight and everyone swipes their cruise cards so there is a record of who comes and goes from the ship. 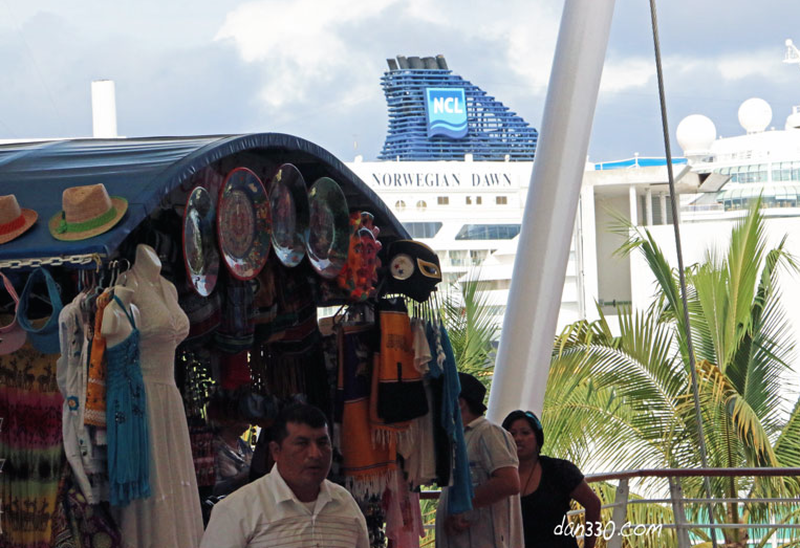 Exiting the Norwegian Dawn on the pier you really get a sense of how massive these ships are. There was another ship across from ours. It was like walking down a canyon of steel. The piers themselves are amazing too. Consider that the ships are nearly 1,000 ft long and it is a long walk to shore if you choose not to take the complementary ride in to shore. 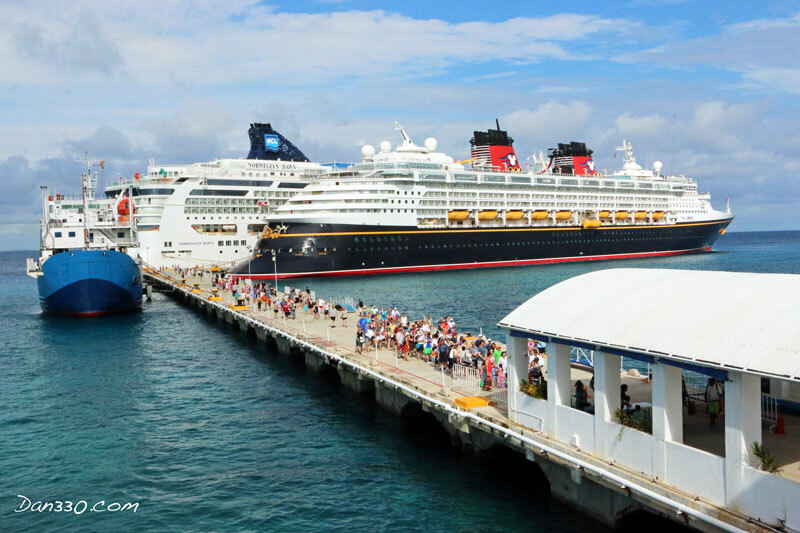 Many ports have lots of activities right on the pier with bands and dancers to greet the guests from the ships. Because I have been to Cozumel before on cruises and many times while I was flying for a living, my plan was to spend my time taking pictures. The area near the pier has been rebuilt into a modern shopping area. You have to do a little walking to get to the more authentic local artisan shopping. There were several places renting scooters. The first place I passed wanted $45/day. I kept walking and the price magically dropped to $35/day and as I walked further it dropped to $30/day. I wasn’t quite ready to go off on scooter, but it was good to know that the scooter rental business was apparently slow on this cruise ship day in port. After taking a bunch of pictures in town and walking a long ways with a heavy backpack full of camera gear, I was ready to rent a scooter. For $25 I got a 125cc brand name scooter for the day. The people ahead of me paid $45 for the same scooter. Ouch. 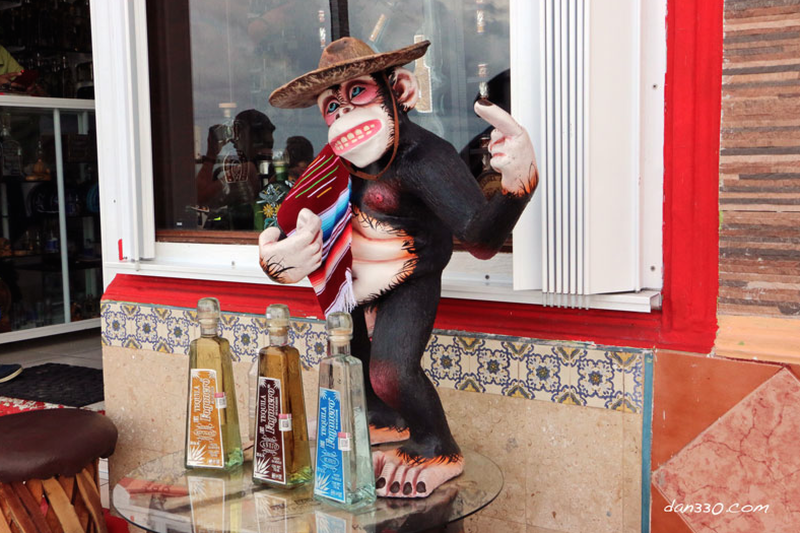 If you go to Mexico, you need to learn how to bargain. 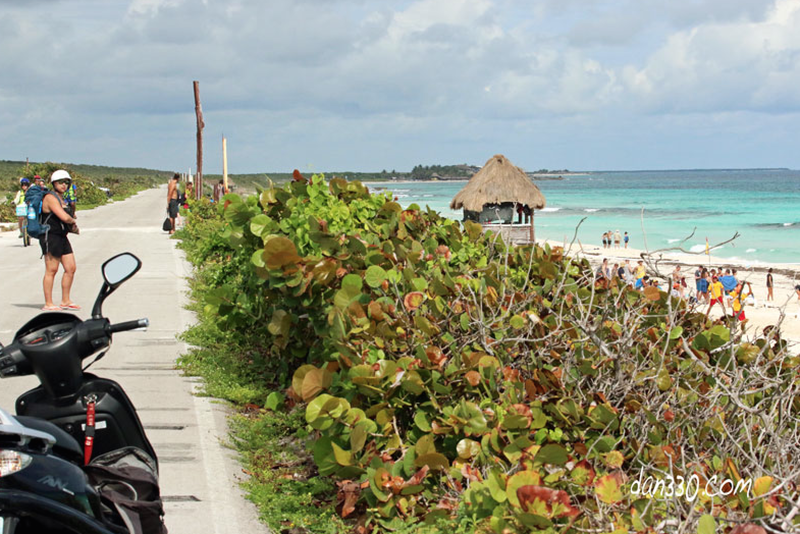 There is a main road that goes around the perimeter of the island from the main town port town of San Miguel de Cozumel. 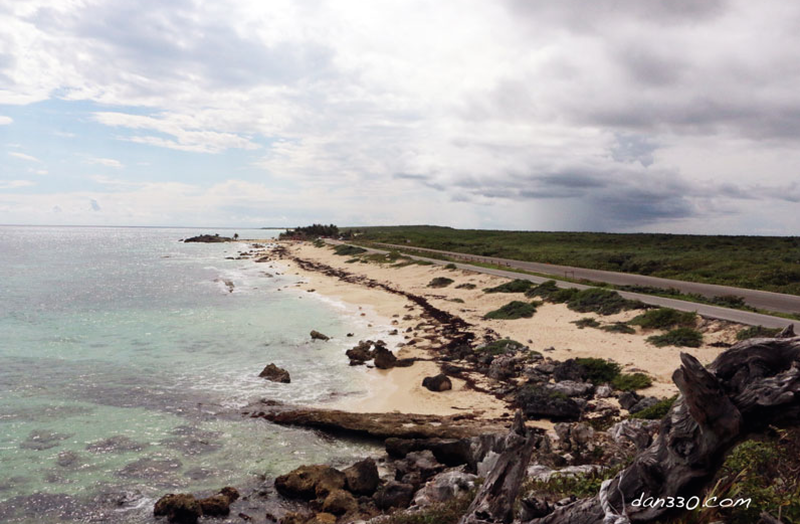 to the south end of the island and up the easy coast and back across the central part of Cozumel back to town. The whole trip only takes about an hour and a half, so off I went. First stop was the south end of the island. There is a park and natural refuge there as well as touristy bars and shops. They do charge to go down to the park and wildlife refuge. 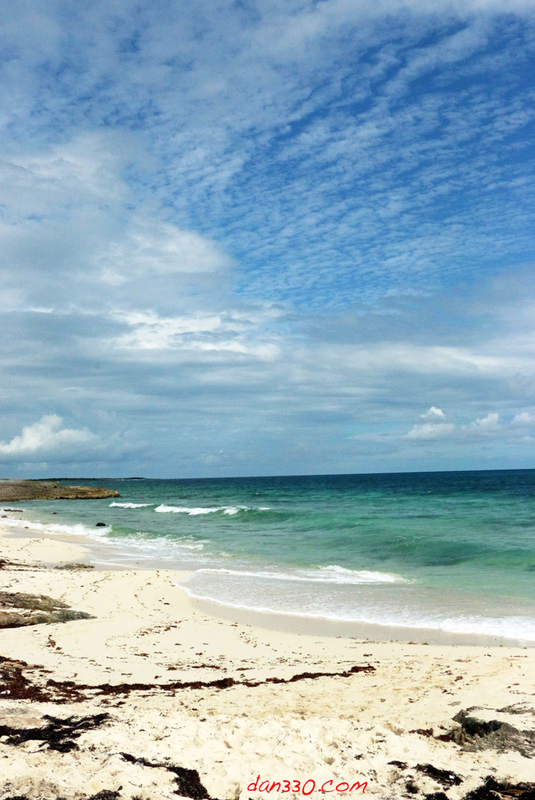 Once you get away from San Miguel, Cozumel has lots of places to get away from the crowds. The beaches on the south and east had very few people at them. The resorts on Cozumel are clustered along the northwest shore of the island north of the airport. There are a few new developments along the main road on the southwest shore. They have built a new road along side of the old road in this part of the island. The crazy thing is that besides pedestrians and bicycles, scooters are allowed on the old road so it is much safer to ride a scooter and you are right on the coast. Pedestrian, bike and scooter path along the shoreline. Further north I found some beautiful beaches. There was even some terrain. Cozumel is pretty flat. The highest point on the island is only about 45ft above sea level. With the nice beaches came more people, but not that many. 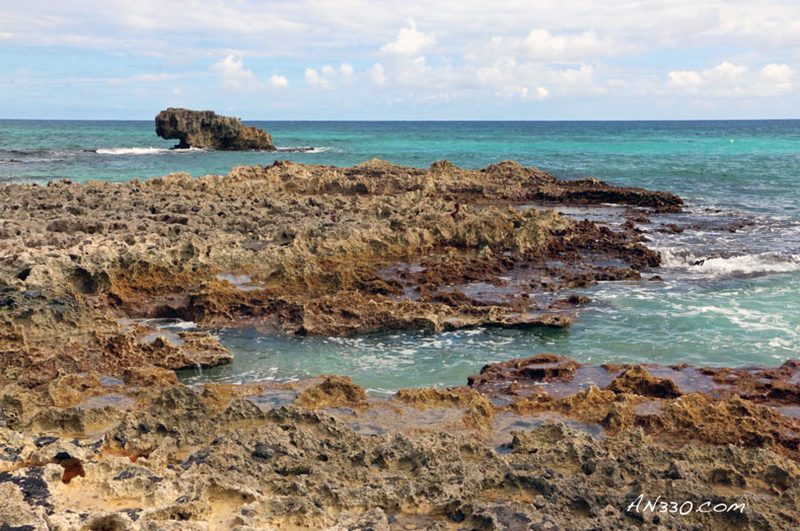 Here is the view from a popular restaurant built on a pile of rock near the shore on the east coast of Cozumel. View from a high spot along the east coast. 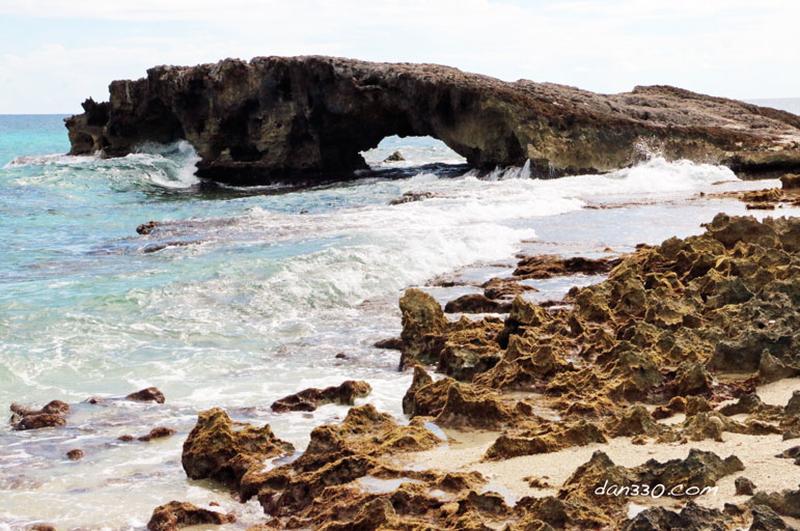 There are some rocky areas on the east coast as well as beaches. I headed back across the island to town. There was one last stop I needed to make before I turned the scooter in. The rental agreement called for the scooter to be returned full of gas. Owning Harleys, I knew scooters barely sipped gas. On this trip around the island I could only have burned about half a gallon of gas. As I got to town, I noticed a gas station with young men waving me in. I thought how convenient that they knew we had to fill up the scooter before turning them in. They even insisted on filling it themselves. Oh oh. I should have known something was up. There was only a mexican peso amount on the pump. Nothing showed how much gas I bought. This was cash only too. My bill was $9.50 for what I estimated was a half gallon of gas. Ouch. They got me. I think they massaged the exchange rate too. This was kind of a bummer for guy who tries to negotiate a good deal. This is a scam I had never seen before. I am thankful that I didn’t rent a car that day. One last vendor to get by before I get to the ship. With the scooter turned in, I headed back to the ship. 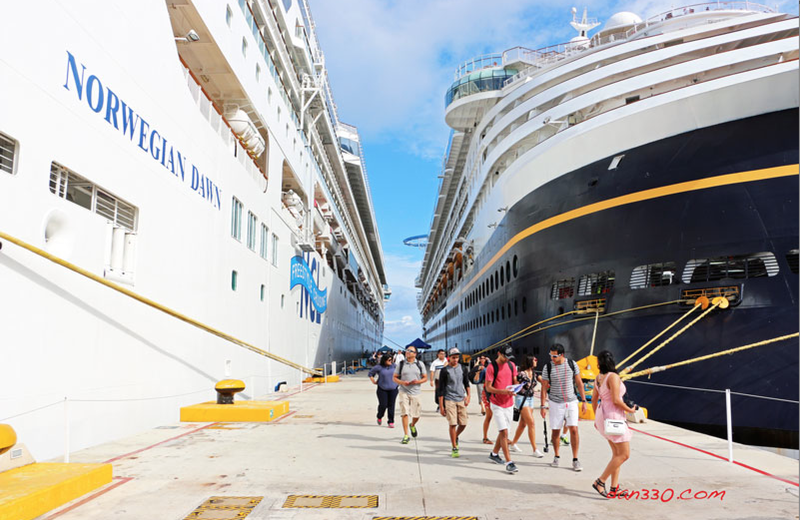 The shops at the cruise terminal are cleverly situated so you have to walk through almost all of them to get to the pier. The shop keepers can be a little aggressive late in the day as they know this is the last chance to sell you something. 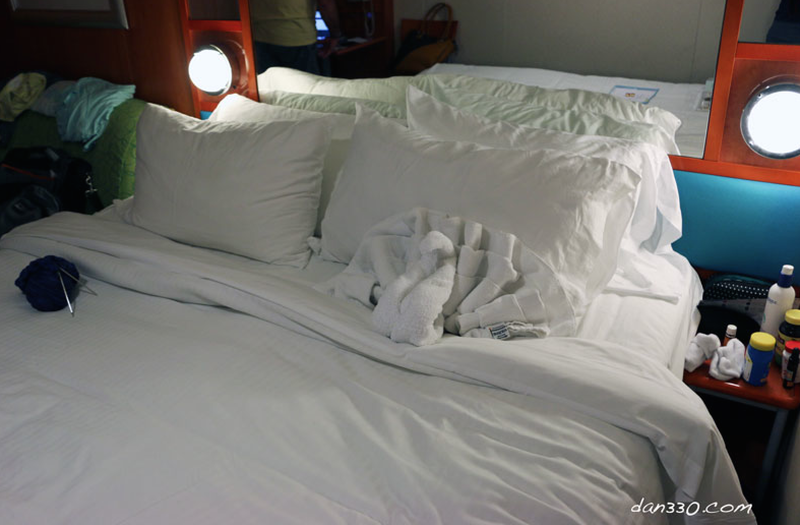 Back on the ship, I met my wife and we kicked back in our cabin before dinner as the Norwegian Dawn departed Cozumel. 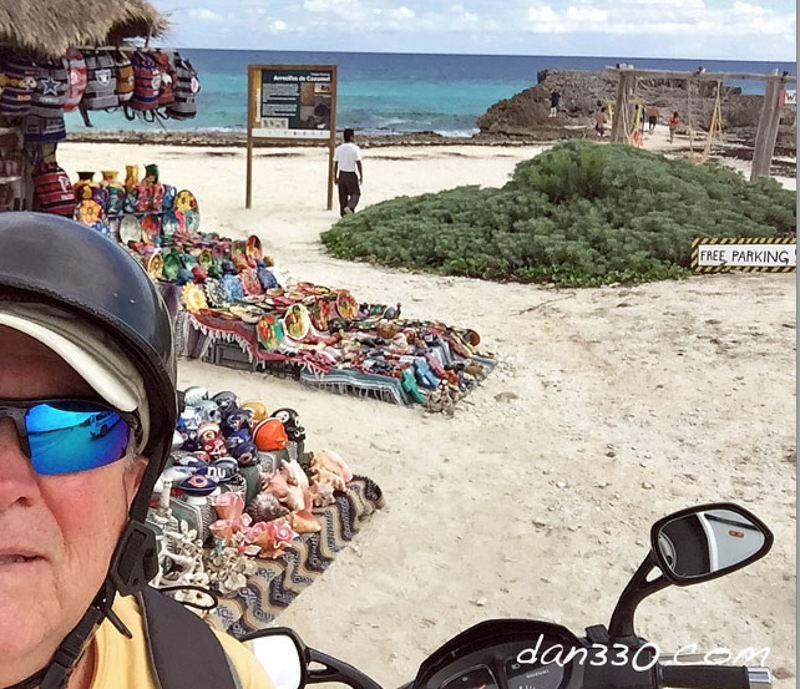 I had a really fun day exploring Cozumel. After enjoying another great dinner on the Norwegian Dawn, we headed back to our cabin. Once again there was a treat waiting for us along with a new towel sculpture. We cruised overnight to Roatan. That’s next in the series. 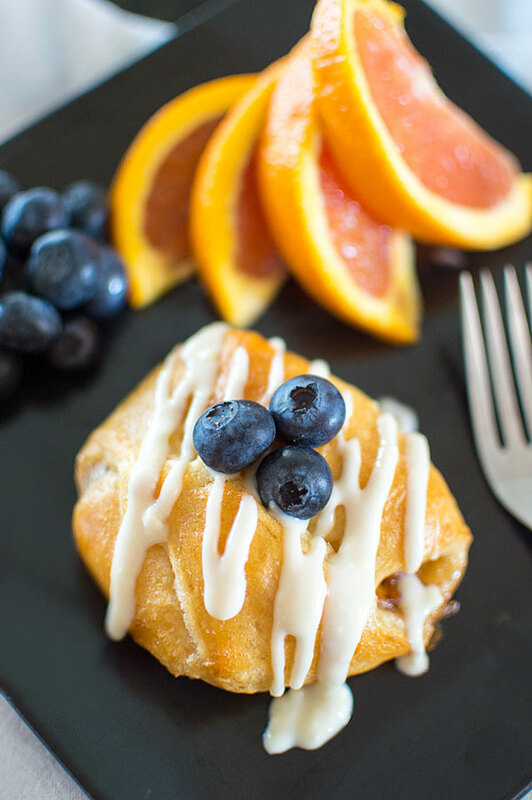 If you are not in big hurry to get going on your Cozumel adventure, enjoy a nice breakfast on board the ship before you head out. Whether shopping or negotiating a rental, vendors are more likely to deal with you if you are at the end of the stream of people coming off the ship. I really enjoyed getting out of town. I regret not going into the park on the south shore. Next time I definitely will. If you see people waving you into a gas station….. turn around go the other way!!! I got had by these guys. Don’t make the same mistake.